Translated from Sweden Rock Magazine #11/2015. 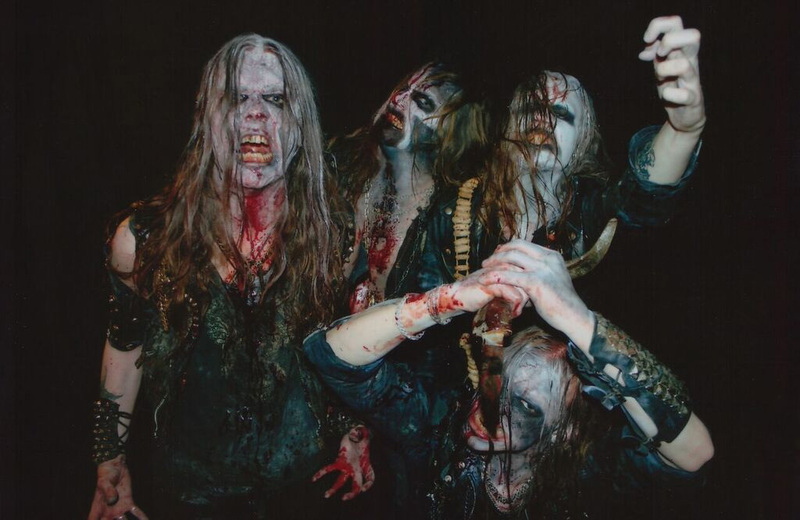 In 2012, Uppsala’s DEGIAL made a name for themselves with their debut “Death’s Striking Wings”, followed by diligent touring throughout Europe. Now, they raise their monument to death with a new album largely recorded in the forest. – “Savage mutiny” is pure death metal – nothing more and nothing less, says guitar player and vocalist Hampus Eriksson. I get hold of Hampus while he and drummer cohort Emil Svensson tour the United States, recruited as session members by fellow Uppsala residents WATAIN. – I’m alright, a bit knackered but I’ll live. Right now we’re in Salt Lake City, a place infested with Mormon scum. There are rumours of a rally against this evening’s show so at least we have that to look forward to. According to Hampus – there’s not much difference in playing live with this significantly more renowned band, compared to his own. – When I get on stage I demand one hundred percent focus and devotion to myself, regardless if it’s with DEGIAL or WATAIN. The energy is the same. We play rock that to us requires a lot more than just banging your head and looking cool. I imagine that’s one reason I’m playing these gigs with them. Any incidents of note thus far? – Touring with these boys tends to render plenty of them but since I’m currently in the midst of it I can’t really think of anything in particular. With booze, guns and metal you can be certain things will end in violence, pain and madness. The album is set for release on December 25 – utterly ignoring industry standard practices aimed at the music media´s album-of-the-year lists. Hampus describes it as ‘death metal darkness’. – To me, this is what a death metal record should sound like. There’s far too much Pippi Longstocking death metal around these days. “Savage Mutiny” is pure death metal – nothing more and nothing less. The promo sheet states that it was recorded and produced by Gottfrid Åhman (ex-IN SOLITUDE) but not where this was done. – We own studio equipment together with Gottfrid. The recording budget was used to expand it, rather than investing cash in someone else’s studio. This made it possible for us to work on the album whenever and wherever we wanted to, instead of having to adapt to an outsider. It’ll also make it easier when we want to record in the future. In order to get a solid foundation for the drum sound we recorded them in a different studio, also with Gottfrid behind the helm. Hampus says that guitar and bass were recorded during a two week-period spent in a rented cabin in Leksand, a rural part of Sweden. – A highly rewarding environment to work in. Two weeks in the December woods provides great inspiration to record a death metal album; another reason to get your own studio. The vocals were recorded in our rehearsal place in Uppsala. Before we even got started we knew everything would work well with Gottfrid. He has an incredible ear for music and contributed a lot to the album. He’s also a close friend of ours, which obviously helps. We share the same vision of how death metal is supposed to sound and be played, so he was the perfect choice. Three years have passed since the debut album, during this time DEGIAL has changed bass player and toured extensively. – We did three tours for the album – two in Europe and one in Scandinavia. The first one was with OBLITERATION from Norway, the other two with WATAIN. Since then we’ve played a few gigs spread over Europe. Our new bass player, Jonatan (Johansson) from Åland’s VORUM, contributed a lot to the album. We first met when we played a few dates together with them, then he moved to Uppsala in early 2013 and we got to know him very well. When Joel (Lindholm, IN AETERNUM, ex-SHINING) left the band just before our first tour we immediately knew who we wanted as his replacement. Considering that Hampus is stuck on a tour bus battling debilitating after-effects of large quantities of fermented beverages, it doesn’t feel like the opportune time to torpedo him with profound matters of the spirit. Hence, I turn to domestically stationed fellow guitar player Rickard Höggren. DEGIAL has previously made it abundantly clear that they take death metal ‘completely seriously’ and that they ‘worship death’. These are notions that appear very difficult for the average metalhead to grasp – and simultaneously claims many make without being able to provide an adequate explanation. – Indeed, says Rickard, at least here where people compared to other places harbour a great fear of death and all that it entails. It’s something of a taboo and maybe that’s why people shy away from it. Perhaps the result of living in one of the world’s most secular countries. – I’m sure there are plenty of metalheads sitting at home listening to old death metal records, worshipping the music. But when the message gets too tangible and serious they’ll either stop or try to laugh it off. Still, they’ll listen to the same album over and over again. This gravity is at the core of what we call death metal. If this aspect is absent, the music lacks substance. Still, this doesn’t explain this supposed adoration for the great leveller. – Ever since the dawn of man people have worshipped death through ceremony and monuments. The music is our monument and live concerts our ceremony. Having said this, perhaps death metal and gravity sound a bit more like a natural combination. Rickard states that DEGIAL can be defined with three words; death, chaos and darkness. – These elements go hand in hand and together constitute the very foundation of what we’re all about. Without one element, the remaining are left with an entirely different significance; this is why it’s inaccurate to claim that our worship is simply manifested in, say the celebration of people dying in general. It’s an expression on a deeply spiritual plane, one which we describe through compositions and lyrics. The name DEGIAL stems from Islamic eschatology, in which the one-eyed devil al-Dajjal has a similar role to that of the biblical Antichrist. A highly relevant gentleman these days, when rallying cries to theological endgames echo across the globe. – The name was something that just came to us and nothing we chose intentionally – why, I do not know. We were made aware at an early stage that DEGIAL was an alternate spelling for al-Dajjal. This is the only thing we have in common really, besides that both represent a destructive force. He speculates that the reason why most metal bands instead tend to draw inspiration from the apocalyptical revelations of the bible is that Christianity is the dominating religion in the west. – If you read our lyrics and focus on the parts based on religion, you’ll find that they are also primarily inspired by them. One will also note that religion is not the focal point but rather part of something greater. For those who hold the stern master Death in high esteem, these must be infinitely rewarding times to reside in. – For those of that inclination, I imagine all times since humans populated this planet would have been. Do you follow current world affairs at all? – Certainly, most people probably do in today´s turbulent times. These days, the doctrines of Abraham and fundamentalism are something that afflicts the world to a far greater extent than in a long time. What this will bring about is something most of us anxiously await. Personally, I don’t support the actions of these abrahamitical fundamentalists at all. In my eyes, this is an incomprehensible clash of ideologies I have no connection to. – Fair enough, I see your point; that DEGIAL would support all manner of war and death. We do not. DEGIAL stands above fundamentalist and political strife. DEGIAL exists on a plane beyond all this. Our vision is of a darkness and power that exists far beyond the material world, what we can see with the naked eye. DEGIAL differs a bit from most of today’s younger generation of Swedish death metal that enjoy some form of prevalence. Most of them tend to espouse a decidedly cleaner image, more akin to bohemian red wine indulgence than servitude to the currents of chaos. This is an approach with very limited foundation in DEGIAL. – Yes, I’ve noticed this. A change in many bands, especially the past two years. There are many with roots in death metal that have changed both aesthetically and musically. I don’t really know why, if they are targeting a larger audience or if it’s a natural progression. Perhaps they’ve realised that they’ve been meddling with forces that frighten them. We are what we’ve always been. Our vision, mirrored in both appearance and music, is impregnable to outside influence. Naturally, we also evolve and change but strictly within the confines of this vision. DEGIAL are often referred to with terms like ‘retro’, which might not be all that big of a mystery considering the prevalent influence from primarily early MORBID ANGEL. However, the big question is what one has to do in order to sound original in the genre these days. – Just as you mention – we are heavily influenced by MORBID ANGEL, NECROVORE, POSSESSED and so on – especially on the debut album (“Death’s Striking Wings”). This is no mystery seeing as they are the ones that led us onto this path. I am however adamant that we have our own sound – a brief listen to any of our material should make it blatantly clear which band it is. This isn’t something that can be achieved in an artificial way and it’s within this we will evolve and stake out new ground. It’s this sound that is the very soul of DEGIAL. He mentions their comrades in WATAIN and the now defunct IN SOLITUDE as prime examples of bands that have evolved a lot musically without severing their roots. – They have retained their sound – or rather, developed and cemented it. Compare their early material to the recent and you’ll immediately be able to tell which band you’re listening to. What they succeed with where many others fail is to progress organically without losing their original character. There are many that evolve but lose their musical soul on the way, especially with newer bands that sometime sound like two entirely different acts from one record to the next. If we were ever to expand beyond the confines we’ve set up we’d never release it under the name DEGIAL.